*This review refers to the Good Genes Lactic Acid, not the Glycolic. Ideally for someone concerned with the texture of their skin or pigmentation and scarring issues. Daily as a serum or when required as a treatment mask. I would suggest using it in the evenings under an oil or a moisturiser. And yes you can use it after exfoliating acid toners. Maybe not P50, but certainly the milder ones. I’ve seen a few reviews recently of people from people that are using it AM and PM as a serum. Personally, I think that’s overkill and you may be opening yourself up to milia and broken capillaries. I’d keep an eye on your skin to ensure it isn’t over-exfoliated. And make sure you are adding moisturiser/oils afterwards. If you are new to acids you will see results in a day or two. If your skin is acclimatised to acids it may take a few more days, but it generally works quickly. £85.00 for 30ml – hard to say but it should last around 2 months if using a few evenings a week (from my experience). 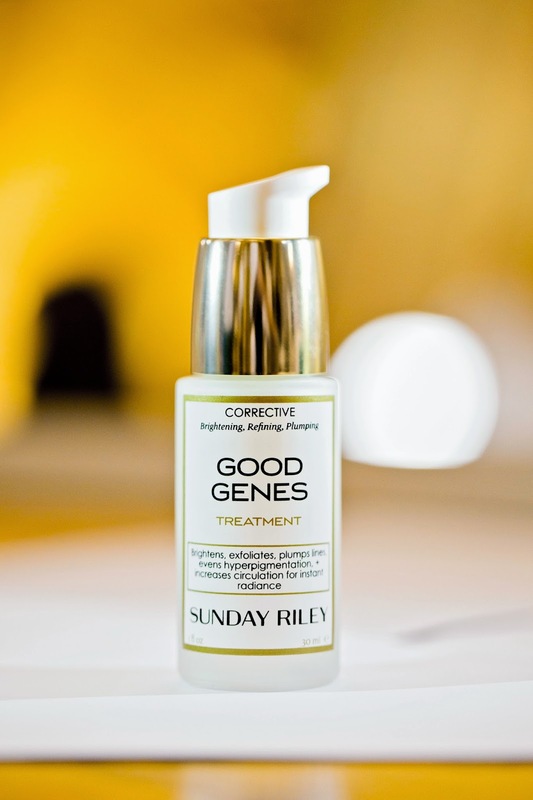 Good Genes gets all the praise because the effect is almost immediate. It contains unneutralised lactic acid which gives it a very low PH. As lactic acid works on the surface of the skin – more topical than its counterparts, the irritation risk is less than with other acids such as glycolic and salicylic. I prefer to use it in the evenings simply because it is so effective at resurfacing that I find my makeup can have a tendency to go patchy if I use it during the day. It is purposely used in a soothing, calming base to counteract any potential irritation from the strength of the lactic acid, and this seems to work well. The low PH may be too much for some skins. You can mix it with Sunday’s Ceramic Slip cleanser for a ‘Flash Facial’. Sunday Riley recommend using this over Luna, but I have always done it the other way around. Good Genes first, then Luna. It’s being revamped as of 25.03.16 and thus unavailable.